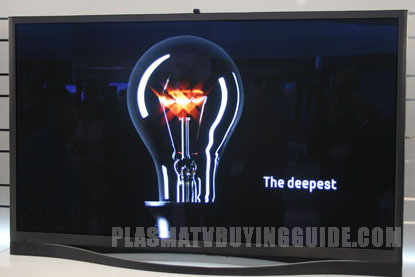 The Samsung PN64F8500 is going to be a bold blockbuster seller for 2013 and early 2014. It's got excellent upgrades from the prior E8000 series that it replaces such as 400% better black levels, 2.5 times better brightness (peak whites), an excellently revamped voice recognition feature, and OLED like contrast and rich, deep colors. 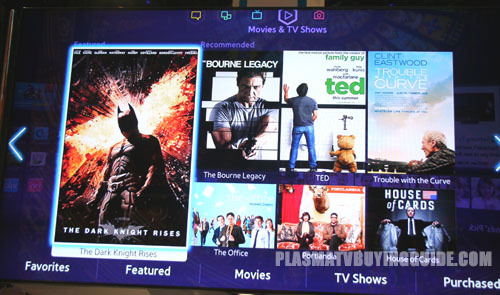 Smart TV features from Samsung are best of breed as well – adding to a package that is going to look too good to pass up to consumers that first take a look at the OLED and 4K UHD TV price tags, then look at this one. The $12,000 in savings might be too good to pass up. 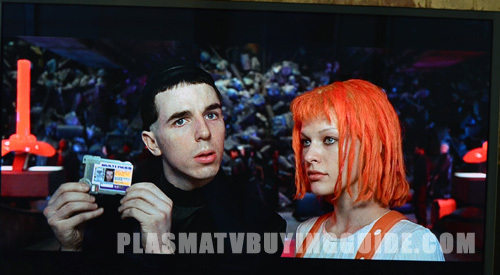 The PN64F8500 plasma TV has the best picture quality for a Samsung TV, and probably any TV out there now. Aside from the VT60 Panasonic for this year that is. Picture quality highlights from this TV are the incredible black levels presented which enlivens the colors so much that you may mistake the TV for an OLED TV. Samsung deems the panel used here the Super Contrast Panel. 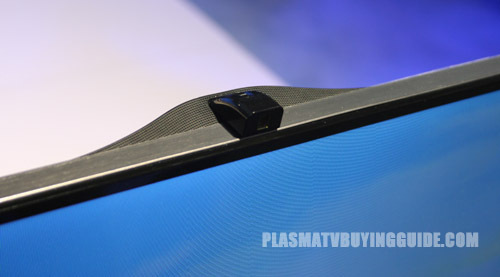 This is the only plasma in Samsung's lineup for 2013 to contain this panel. I was extremely impressed with the contrast and how color popped off the screen. 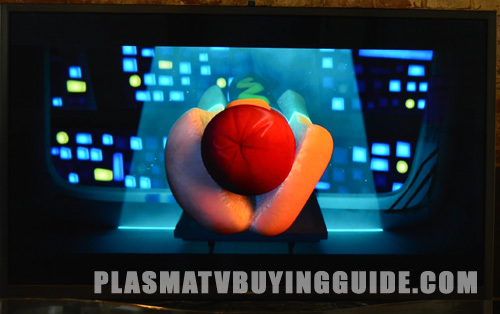 There are many similarities between the picture quality on this plasma and a new OLED TV – rich saturated colors, inky blacks, perfect side angle viewing, and incredible contrast. It has the upper hand on the VT60 when it comes to brightness and light-flow saturation through the picture. I also prefer the color rendition of the F8500 to the VT60. It's a little warmer and smoother with less background motion artifacts once calibrated (With the Standard or Dynamic picture settings there are lots of foreground and background artifacts). Another plus is bright room performance. I know that is strange for a plasma, but true. Samsung hit a home run, by making this plasma accessible to rooms where ambient light can't be eliminated. Screen reflections are minimal thanks to the light absorbing louvred filter that traps room light instead of bouncing it back. The 64F8500 has very little judder, even with the Motion Judder Canceller feature off. Shadow detail is incredible and isn't washed out even next to bright areas on the screen. A natural sense of depth is seen that causes 2D images to come to life. 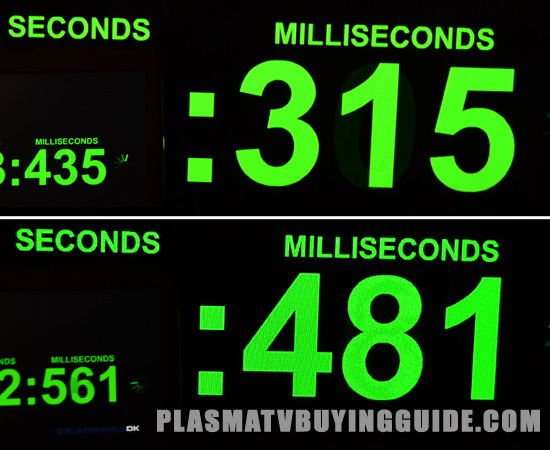 Plasmas always perform better than LED TVs when it comes to this. This is one of the most impressive things about this Samsung plasma. On top of the top tier picture quality, the PN64F8500 puts out enough light that it compares to the brightness of the LED TVs on the market. 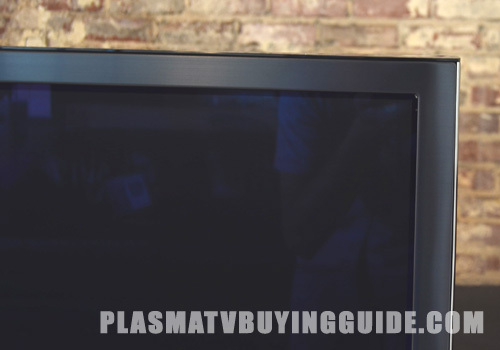 Plasmas are typically known for their lack of bright pictures, so this is a refreshing change that makes it possible to place this TV in brighter rooms. 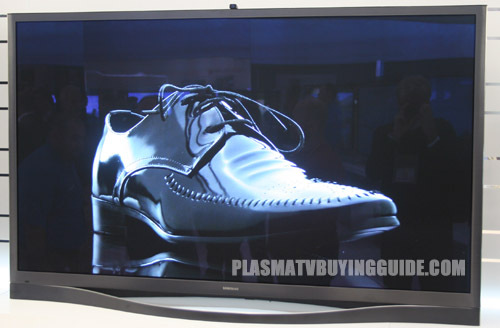 Compared to some of the top end Panasonic plasmas like the VT60 and ZT60, this one has the leg up on brightness. Yes, this is one of those room light sensors that control the brightness. What the Eco Sensor does is control the Cell Light levels depending on the ambient light in the room. It is on by default in the some of the picture setting, but disabled in the Movie setting. If the TV ever starts to dim unexpectedly, this is the first place to look for a solution. From the main menu, this is where it can be found: System > Eco Solutions > Eco Sensor. 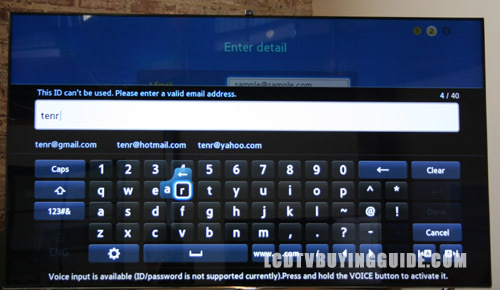 This is called the Auto Motion Plus feature on Samsung's LED TVs. There are only 3 settings on the F8500: Standard, Smooth, Off. No Custom settings this time. By default, the Motion Judder Canceler is set to Standard in all preset picture modes. This feature is best turned off for film based content, because it creates unnatural movement and lessens natural background blur (The Soap Opera Effect). But it brings live sports programming and 3D content to life, by doing its job and getting rid of judder without the negative effects. This is where the Motion Judder Canceler set to Standard really comes in handy. Distracting amounts of judder are present without it. You won't see it completely eliminated, but it's closer to the level of watching a blu-ray with the feature off. 3D images are deep and clear with little to no crosstalk. The F8500 does not show any dimming with 3D content either. The picture remains bright and sharp. We watched a documentary called India: The Royal Experience from the Explore 3D App. The short documentary was an excellent example of depth the 64F8500 is capable of, but colors were muted. Scene changes led to some eye fatigue. The design of the 3D glasses is pretty similar to last year, but you'll see they are a little more streamlined. They have clean lines and are super light. They do produce slight flicker if you are viewing in a room with incoming light from the front. The glasses do feel flimsy and the arms cannot be folded for storage. 4 pairs are included with the PN64F8500. If more are needed they are very affordable. 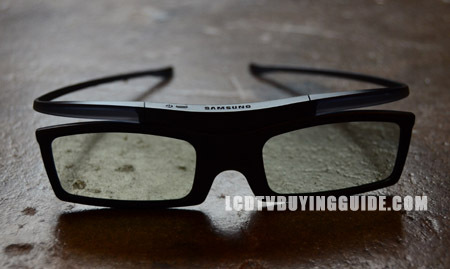 The Samsung SSG-5100GB glasses sell for around $20. With a press of the 3D button on the remote, the PN64F8500 takes 2D images and adds a strong sense of depth. The Blu-ray of Troy provides good results and the picture was only dimmed slightly. Switch the Motion Judder Canceler to Standard gets rid of the judder that 3D conversion creates. It's not the best on the market, but it has the potential to make familiar content fresh. It's hard to get away from input lag on this plasma TV. That's the biggest problem. The picture is great, but precise and responsive button inputs are not what a gamer is going to find here. It's a little better with the Game Mode enabled, but still about 2.5 times worse than some of the Samsung LEDs we tested. It's located here: System > General > Game Mode. Going in and out of this menu every time you turn on a game may get tiresome after a while. Game Mode really hurts the picture quality at first because the Sharpness is set to 50. Lower it to 5 for a huge difference. First person shooter Crysis isn't unplayable with the input lag, but the game certainly has a sense of clunkiness about the controls. 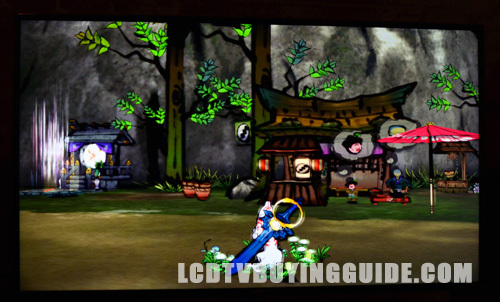 An action game like Okami HD may do a little better with the lag, but we still notice it. 2D to 3D conversion on Okami HD provided a deep and engrossing image, but judder hurt the experience. Enabling 3D playback on Crysis provides the same results. Turning on the Motion Judder Canceler didn't help either as the input lag gets worse and movement is unnatural. The Samsung PN64F8500 does not test as well for games as some of the other LED TVs that we have looked at this year, like the F6400 and the F8000. This should not be primarily a gaming TV. The PN64F8500 features the updated for 2013 Samsung Smart Hub. It's a very intuitively designed interface with a sleek appearance. All of our interactions with it have been pleasant and enjoyable. Samsung's Smart Hub features the biggest selection of apps available as well. This is one of the biggest draws for the platform. Apps are fast to load and operate thanks to the quad core processor under the hood of the F8500. See the full Samsung Smart Hub Review here for more. This feature has the potential to really speed up Smart Hub navigation once one learns the ropes. Simple commands like “Netflix” immediately open the Netflix app. Saying “Movies with Tom Cruise” causes the Smart Hub to bring up a list of recommendations with Tom Cruise. Pretty useful stuff. In the web browser you can say a search term, but the keyboard for the search field has to be on screen for it to work. The learning takes place when it comes to knowing the exact commands the Smart Hub wants to hear. For example, to open the Web Browser you have to say, “Web Browser.” Saying “Internet Browser” confuses the Smart Hub and nothing happens. In the end it's not as good as LG's voice recognition, but better than Panasonic's.6 out of 10. The PN64F8500 is equipped with a built in pop-up camera that allows motion control with your hand. It is easy to engage once the camera is out of its hide-a-way behind the screen. All you have to do is hold an open hand in front of the screen. The camera is pretty responsive at recognizing a hand. Once it sees it a cursor appears. Move your open hand around to move the on screen cursor. Item selection gets a little tricky. You have to make a fist then open it again, all while staying in the same spot. A lot of our selections went awry because of this. Talk about an arm workout. After some practice I'm sure it gets better. If you move the cursor to the left side of the screen, a volume control appears. Same on the right with selecting channels. Move the cursor to the top right hand corner and a menu appears that lets you back up, switch inputs, open the recommendation menu, or power off the TV. The back command is one that will be used a lot and having to open a second hand menu to do it is very tedious. 5 out of 10. Initially opening the Browser and loading pages is fast. That is the biggest improvement over previous years. The Touch Pad remotre comes in handy for controlling the cursor as well. Hint: To scroll up and down pages faster, slide your thumb on the extreme right or left side of the touch pad. LG's Magic Remote is by far the best way to browse the web on a smart TV to date, but Samsung is taking steps in the right direction. The web browser on the F8500 is not a bad option if you want to see online content on the big screen. First of all, volume isn't an issue on the 64F8500. Even at about 50%, there is enough volume to fill a room. But isn't going to remedy the lackluster sound quality. We find way too much emphasis on background sound effects and music on the Standard mode. Voices are drowned out and muddled as a result. Different sound modes like Clear Voice, Movie, and Music don't provide enough difference to fix the issue. The Sound Effects menu provides Dialog Clarity and Virtual Surround options. Virtual Surround gives everything a tunnelesque and hollow sound, so it's not recommended. Dialog Clarity moves in the right direction to bring voices to the front of the sound, but only slightly. Even a musical like Mama Mia! has a flat sound that leaves us wanting more. This one is much better off with a sound bar or home theater set up. This is a big difference between the E8000 from last year and the 64F8500. The design has been totally revamped to come up with something dynamic. The overall depth of the display is 2 inches. Rather than go for the frameless window design look, the PN64F8500 strives for an industrial design with a brushed gun metal frame of 1 inch on all the sides and 1.5 inches across the bottom of the screen. Samsung calls this the Metallic Magnum Design. The outward sloping "Flow" stand has the same color as the frame and is something we've never seen before. It's attached in such a way that it looks like it's all one piece with no separation between the stand and the TV. It's worth noting that the stand is as wide as the TV itself, so that may limit where the TV can be placed if it is not wall mounted. The TV didn't feel as solid as we would have liked after installing the stand either. There is some play, but that might be the intended design. The price on the PN64F8500 is hard to swallow at $3,400 but if you want the best in the market this and the VT60 and Samsung F8000 LED are it. The Panasonic TC-P65VT60 is the closest competitor with a similar price. It's got an extra inch over the F8500 and slightly better picture quality. Bright room performance is stronger on the F8500 though. The top tier Samsung UN65F8000 LED sells for the same price as well.